Matt Murdock has been through a lot over the last year and a half over in Daredevil. From the public revelation of his secret identity to his incarceration to the death and resurrection of his best friend to marital troubles to travels abroad, he’s been through the ringer in almost every way imaginable. As fate would have it, the poor man isn’t yet in the clear, either, as the storm clouds have gathered once again for this 100th issue. One of the most endearing details of this character is his ability to grit his teeth and power through moments dark enough to blacken almost any soul. He’s seen the violent murder of more than one lover, but each time resisted the urge to corrupt his own ideals and cross that moral line. He’s had his life torn apart at the seams by more than one nefarious character, then stood tall in the end. But what’s magical isn’t his capacity to overcome those problems, rather his ability to convince the reader that this time he might not. Ed Brubaker understands that element of Matt’s personality, just like Brian Michael Bendis, Kevin Smith, Frank Miller and company did before. He knows how to push the character to new limits, introduce that thread of doubt into the mix, and leave him beaten and bleeding at rock bottom. This issue is all the proof you’ll need of that. While the main villain of the tale isn’t a marquee name, he’s familiar enough with Daredevil’s strengths and weaknesses to really make things interesting. It’s not quite the be-all end-all conclusion I was expecting from this milestone, (indeed, the conclusion is left open ended) but it’s a really good read with huge implications for the character’s very near future. The artistic chores, handled here by a half-dozen pencil pushers with a hand in the hero’s past, range from outstanding to passable. It’s nice to see a lot of these guys working their magic with the character, and where there’s always a risk of disjointing the story and losing the reader’s concentration by filling the book with an all-star cast like this one, that wasn’t even a concern thanks to some tricky writing. Each artist’s work is introduced by a page from regular artist Michael Lark, coinciding with a “moment of clarity,” as Matt flashes from a drug-induced hallucination to reality and back again. The concept gets a bit redundant after the first few instances, but it’s always handled creatively and entertainingly, so the sin is forgivable. The parade of historical artists is treated to a page or two of material apiece, which is almost always geared to suit their own style or era of work with the character. John Romita Sr, for instance, treats an imagined conversation between Matt and Karen Page in the bright, simplistic style you’d expect from a romance book. Bill Sienkiewicz, on the other hand, addresses Matt’s troubled relationship with Elektra in a darker, fractured style. It’s tough to imagine a scenario where two styles as vastly different as those two can co-exist, but Brubaker provides it with ease. 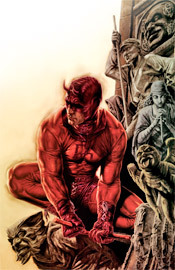 It’s tough to go into a noteworthy issue of Daredevil without expecting the title character to get slapped around a little bit, be it physically or emotionally, and on both fronts this issue delivers. The artists play their roles well, if a few don’t feel quite as comfortable as others, and the story accommodates them without distracting us from the ongoing plot. This book’s been on a roll for years now and it doesn’t look like the ride will be slowing down any time soon, so I’m recommending you buy it and enjoy.